The man known as ‘The Red Rocker’ on account of his flowing curly mane is a full-fledged hit machine who has been wowing crowds with spectacular showmanship, ace guitar work and the ability to segue from super groups to more modest projects. A questing spirit in rock and roll, Sammy Hagar is far more than yer average heavy metal dude. Apart from a prolific career that has given us dozens of class albums and singles Hagar was the focal point for the band Montrose and would replace Dave Lee Roth in Van Halen on several occasions. Having worked with everyone from Joe Satriani to Michael Anthony and Chad Smith he has plenty of Platinum in his collection but he is also one of the smartest and most astute businessmen in his sphere, thanks to successful investments in Tequila, beach bars and a restaurant chain. Renowned for his palette as well as his taste in decent rock our man Sammy doesn’t waste time. In 2011 he published his autobiography, Red: My Uncensored Life in Rock and that went to the top of the New York Times hardcover list. He’s been making high-octane music since the seventies and we’ve got a whole lot of it here for you to sip. Born in John Steinbeck country, Salinas, California, the young Sammy Hagar was in a slew of local garage bands in the mid to late 1960s, notably the Fabulous Castilles and The Justice Brothers. His break came when he teamed up with Ronnie Montrose, adding his second lead guitar and distinctive throat to the band Montrose whose single hit ‘Bad Motor Scooter’ became a metal FM hit. But Hagar was too big for Montrose and had squads of A&R men desperate to push him down Solo Avenue. His debut, the none-too idle boasting Nine On A Ten Scale isn’t your standard fare either. It includes the Van Morrison song ‘Flamingos Fly’ which Van the Man gave him as a gift (he later cut his own version on A Period of Transition) and Hagar’s original ‘Keep on Rockin’’ would be tackled by Bette Midler on the classic soundtrack to The Rose. Other points of interest: Fleetwood Mac’s Bob Welch was another generous donor. He gave Hagar the track ‘China’, and to emphasise the artist’s own versatility there’s a splendid version of Donovan’s ‘Young Girl Blues’ to be found. Checking the credits you find Hagar nuzzling up with some totally terrific sidemen – Humble Pie’s Jerry Shirley, Steely Dan's Jim Hodder and CSN&Y's Dallas Taylor are in the drum seat, Montrose man Bill Church is on bass and Tower of Power add their horn charts. 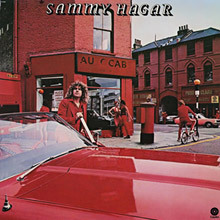 The self-titled Sammy Hagar (1977) is also known as ‘The Red Album’, for reasons made clear when you see the cover art photo, which was shot in Stockwell. Although sales for this album were modest at the time it’s now regarded as a classic. Scott Matthews plays drums for Sammy on the cut ‘Red’, there’s another Donovan demolition job on ‘Catch the Wind’ and a highly astute reading of the Patti Smith/Lenny Kaye song ‘Free Money’ – hardly the type of material you’d expect, but further indication that Hagar has many strings to his bow. Musical Chairs and All Night Long maintained the quality control with producer John Carter always keen to push his man into unusual territory. The latter is Sam’s first live album – recorded with no overdubs at all – and finds him bossing his patch in a variety of Californian halls. Hagar felt entitled to include a few of his Montrose smashes within and this album is regarded as a masterpiece in discerning heavy rock circles. Street Machine and Danger Zone take Hagar at full pelt to the end of decade. Now choosing to self-produce Hagar stays ahead of the curve on cuts like ‘Falling in Love’ which features most of the group Boston while Neal Schon and Steve Perry from Journey crop up on the signature song ‘Run For Your Life’ (produced by Boston’s Tom Scholz). By now Hagar’s standing in hard rock circles had him figured as a legend and his status is affirmed with Sammy Hagar: Live 1980, that features his tightest quartet and a selection of sumptuous rockers in the shape of ‘This Planet’s on Fire (Burn in Hell)’ and the crowd pleasing ‘Trans Am (Highway Wonderland)’. Following his decampment to the mighty Van Halen – where he more than filled Dave Lee Roth’s silver boots - we pick him up again on I Never Said Goodbye, whose pun soaked title is as mouth watering as what’s inside. This is a real humdinger and should be in any hard rocker’s collection. Backed by Eddie Van Halen, Jesse Harms and David Lauser, Hagar ups his metallic ante here on ‘Eagles Fly’ – this will appear on Van Halen’s Balance tour. Mixing some thrashing acoustics to some hard driving lyrics this classy disc includes ‘Privacy’ (a swipe against the Californian Highway Patrol who continually pulled the rocker over for driving in a dark tinted window limousine) and the space rocker ‘Returning Home’, continuing a Hagar meets the aliens theme that you’ll find elsewhere in his extraordinary canon. After the slick hippified Marching to Mars (co-produced by the Dead’s percussionist Mickey Hart), Sammy comes back into our view with Greatest Hits Live! – a more than handy distillation of previous arena assaults – and some very special compilations – all of which contain hidden gems and rarities for your delectation. Rematch (1982) is fifteen tracks of prime time Hagar excellence and Red Hot (1989) is not too shabby either. The Best of Sammy Hagar includes the first available CD version of Hagar’s cover of Otis Redding’s ‘(Sittin’ On) The Dock of the Bay’ (a regular live delight) with guitarist Steve Cropper on hand. Turn Up The Music (1993) is named after a fan favourite rocker and also features the sublime ‘Urban Guerrilla’. The Best of Sammy Hagar and Masters of Rock fill in any gaps for aspirant Hagar watchers. The latter album has long been a cherished listen for Sammy’s legions of UK fans since it finds room for the live version of ‘Space Station 5’. Classic Masters is a fine 24 bit digital remastering of The Best of … and sounds terrific in any environment. The Essential Red Collection (2004) delivers plenty of surprises, B-sides and soundtrack cuts. All in all there is a wealth of material above for newcomers to the Hagar way of life and enough grand sounds to avoid those pesky nostalgia traps for older aficionados. What we might call – 10 on a Ten Scale. Happy rocking. Nine on a Ten Scale is Sammy Hagar's first solo album. Sammy Hagar is Sammy Hagar's second solo album, released in 1977. It is also often referred to as The Red Album, as it includes Hagar's first anthem, "Red", which is also the basis for his nickname "The Red Rocker". Future multi-platinum selling producer, Scott Mathews was talked into playing a drum solo on "Red" after being told Ringo Starr had played his only drum solo in the very same room on The Beatles' last album, named after the EMI Studios this album was recorded in, Abbey Road. The distinctive cover image was shot in Stockwell Road, London, SW9 in the midst of the rows of red Pride & Clark auto shops. These red-painted buildings are also seen in the 1966 film Blowup. 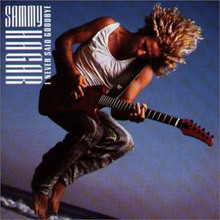 Sammy Hagar's 1987 solo album, I Never Said Goodbye, is also sometimes known as Sammy Hagar since early pressings were untitled, pending the results of a contest. Nevertheless the albums are completely distinct. Musical Chairs is Sammy Hagar's third solo album. Danger Zone is a Sammy Hagar solo album, his last new studio album during his tenure with Capitol Records. The album includes appearances by the Journey singer Steve Perry and the Journey guitarist Neal Schon. I Never Said Goodbye is a Sammy Hagar solo album, his only solo album released while he was a member of Van Halen. The album was recorded in ten days as a contractual obligation to Geffen Records as a condition of his leaving the label to join Van Halen and their record label, Warner Bros. Records (Geffen's distributor at the time, and also, Hagar's home when he was part of Montrose). The album was originally titled Sammy Hagar, and included an untitled cover. The album was renamed I Never Said Goodbye, the name being chosen as part of an MTV promotional contest. 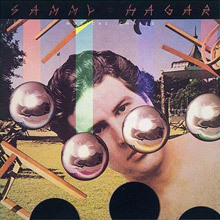 Some pressings retain the title Sammy Hagar, not to be confused with the 1977 album Sammy Hagar. It features Eddie Van Halen on bass guitar, who said in an interview that he also played a very brief part on guitar uncredited. The songs "Give to Live" and "Eagles Fly" were also performed live by Van Halen together with Hagar. "Give to Live" also topped the Mainstream Rock Tracks chart in 1987, a first for Hagar as a solo artist. The former song was included on the album Live: Right Here, Right Now, the latter on the optional bonus disk as well as on the "Jump" single. 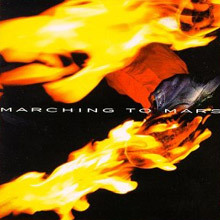 Marching to Mars is Sammy Hagar's first post-Van Halen solo album. It features various musicians on different songs. It was released on MCA Records, which had by that point acquired his former label, Geffen Records. "Little White Lie" was a major mainstream rock hit, topping the mainstream rock tracks chart for five weeks. 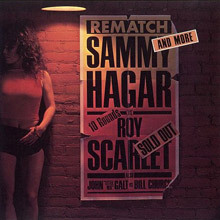 Rematch is the first US-released Sammy Hagar compilation album. After Sammy left Capitol Records for Geffen in 1981, and after Rick Springfield had a hit with the Hagar-penned "I've Done Everything for You", this collection was released to capitalize on that momentum. The album was originally released as a 10-track LP, but in 1987, Capitol re-released the collection on CD as "Rematch And More", adding five more tracks from the Capitol albums. 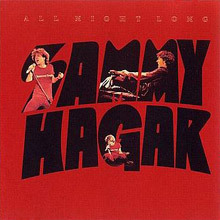 All Night Long (Loud & Clear in the UK) is Sammy Hagar's first live album. The album contains no overdubs. The album was recorded during concerts in San Francisco, San Antonio, San Bernardino, Santa Cruz and Santa Monica. Classic Masters is a Sammy Hagar compilation album in the Classic Masters series. The track listing is identical to The Best of Sammy Hagar albeit with 24-bit digital remastering. 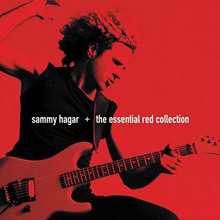 The Essential Red Collection is a greatest hits compilation by Sammy Hagar. It includes some of his early works, from "Bad Motor Scooter" with Montrose, released demos, film soundtrack cuts to more recent material. It was released in 2004 on Hip-O Records. It doesn't include any of his material with Van Halen.